Using the unifying valuation framework based on the Law of One Price, top researchers Jonathan Berk and Peter DeMarzo have set the new canon for corporate finance textbooks. Corporate Finance blends coverage of time-tested principles and the latest advancements with the practical perspective of the financial manager, so students have the knowledge and tools they need to make sound financial decisions in their careers. Note: You are purchasing a standalone product; MyFinanceLabTM does not come packaged with this content. Students, if interested in purchasing this title with MyFinanceLab, ask your instructor for the correct package ISBN and Course ID. Instructors, contact your Pearson representative for more information. Professor Berk’s research interests in finance include corporate valuation, capital structure, mutual funds, asset pricing, experimental economics, and labor economics. His work has won a number of research awards including the TIAA-CREF Paul A. Samuelson Award, the Smith Breeden Prize, Best Paper of the Year in The Review of Financial Studies, and the FAME Research Prize. His paper, “A Critique of Size-Related Anomalies,” was selected as one of the two best papers ever published in The Review of Financial Studies. In recognition of his influence on the practice of finance he has received the Bernstein-Fabozzi/Jacobs Levy Award, the Graham and Dodd Award of Excellence, and the Roger F. Murray Prize. He served as Associate Editor of the Journal of Finance, Director of the Western Finance Association, Academic Director of the Financial Management Association, is a Fellow of the Financial Management Association, and is a member of the advisory board of the Journal of Portfolio Management. Peter DeMarzo is the Mizuho Financial Group Professor of Finance and current Vice President of the American Finance Association. He is also a Research Associate at the National Bureau of Economic Research. He currently teaches MBA and Ph.D. courses in Corporate Finance and Financial Modeling. In addition to his experience at the Stanford Graduate School of Business, Professor DeMarzo has taught at the Haas School of Business and the Kellogg Graduate School of Management, and he was a National Fellow at the Hoover Institution. Professor DeMarzo received the Sloan Teaching Excellence Award at Stanford, and the Earl F. Cheit Outstanding Teaching Award at U.C. Berkeley. Professor DeMarzo has served as an Associate Editor for The Review of Financial Studies, Financial Management, and the B.E. Journals in Economic Analysis and Policy, as well as a Director of the American Finance Association. He has served as Vice President and President of the Western Finance Association. 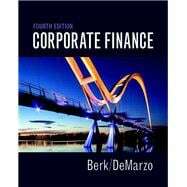 Professor DeMarzo’s research is in the area of corporate finance, asset securitization, and contracting, as well as market structure and regulation. His recent work has examined issues of the optimal design of contracts and securities, and the influence of information asymmetries on stock prices and corporate investment. He has received numerous awards including the Western Finance Association Corporate Finance Award and the Barclays Global Investors/Michael Brennan best-paper award from The Review of Financial Studies. Professor DeMarzo was born in Whitestone, New York, and is married with three boys.